For more than 60 years, 75% of Vieques, an island municipality of Puerto Rico, were used by the US Navy as military practice grounds. Though the US forces left Vieques in 2003, after historical protests due to a detonation that killed a civilian, hundreds of acres of la Isla Nena are stilled polluted. Terrains are contaminated with undetonated munitions and bombs, as well as with toxic chemicals. Because of that, the former Atlantic Fleet Weapons Training Area in Vieques is categorized as a Superfund Site by the Environmental Protection Agency (EPA) and a full cleanup of Vieques, as stated by US agencies, would not be completed until 2032. This is a great burden for the approximately 10,000 residents of Vieques. Many of those terrains are not in the hands of Viequenses, which could limit many community-level initiatives that aim to improve the island’s living conditions. Furthermore, various studies have shown that the land and marine animals in Vieques are polluted with heavy metals and Vieques, in comparison with the rest of Puerto Rico, has a higher incidence of cancer. Hence, any initiative that furthers the cleanup progress in Vieques and does not threaten the public’s well being must be taken into consideration. 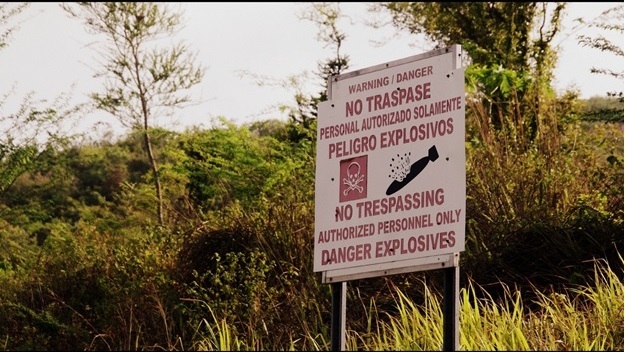 In the last years, much of the munitions and bombs in Vieques have been eliminated through Open Burning and Open Detonation (OB/OD), a common processes that has been used in Vieques and elsewhere. OB/OD is a relatively cost-effective, direct and rapid method. Nonetheless, detonating or burning the material in the open air generates pollution that not only harms the environment, but also threatens public health and safety. The gases and particles produced from this practice contribute to further contaminating and harming Vieques and its people. For years, Viequenses and members of the Puerto Rican scientific community have criticized OB/OD, and demanded better cleanup practices for Vieques. A recent report from the National Academies of Sciences, Engineering and Medicine of the United States, gives credence to these criticisms by questioning the use of OB/OD, and proposing alternative methods in favor of the environment and public health. The report, entitled Alternatives for the Demilitarization of Conventional Munitions, highlights that alternative methods reduce gas emissions in comparison to OB/OD and thus, lessen the impact to the environment and public health. It also concludes that one significant challenge to putting new cleanup methods in place is the lack of prioritization and funding from Federal agencies. The people of Vieques have been heavily impacted by the recent austerity measures, changes in maritime transportation, and the impacts of Hurricane Maria. It is time to put the wellbeing of Viequenses and scientific evidence as a top priority in our policy-making. We call on the US Congress, the Federal agencies in charge of cleanup in Vieques, and the Puerto Rico Legislature to take into consideration the recommendations from the National Academies, a highly regarded and prestigious scientific entity. It is necessary to adopt new measures and technologies that restore Vieques’ lands without threatening the public health and safety of the people that live there. We also call on Puerto Ricans living in the States to urge their representatives and senators to pass legislature in favor of Viequenses. For more information on how to do this, check out our recent policy alert. This article was published in El Nuevo Día as part of a collaboration with CienciaPR. Luis A. Rodríguez Cruz is a social scientist and doctoral student at the University of Vermont, a member of Ciencia Puerto Rico, and ambassador of the Puerto Rico Science Policy Action Network.